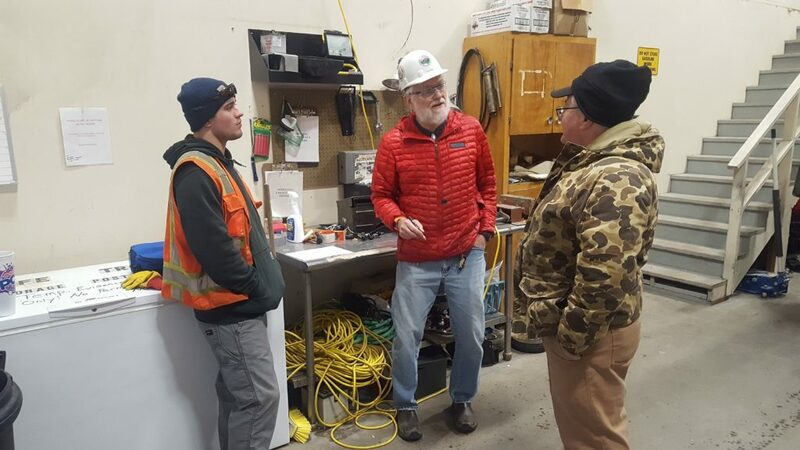 On Friday, January 18, a team of four tackled installation of a MESH Network 3.4 GHz Ubiquiti NanoStation as well as a VHF antenna at the SAR Cache on Tudor Road in East Anchorage. Tom Plawman (KL4RQ), Bill Laxson, (KL7IPO), me (KL5T), and most importantly, our bucket truck operator and exterior installer Zach, descended on the facility at about 1:00 pm. KL7IPO graciously supplied the bucket truck and our great technician Zach for the tough outside work. It was downright chilly, about 15 degrees, so this was no simple endeavor. 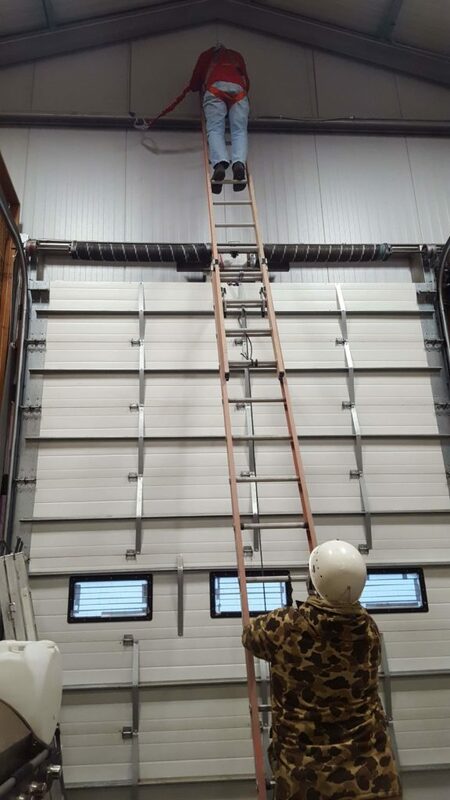 While exterior work was handled from the bucket truck, inside was mostly handled from an extension ladder, with KL7IPO performing the ladder work. Tasks involved installing Unistrut to mount the antenna mast, installation of the mast itself, installing a penetration with sleeve through the insulated sandwich panel exterior wall of the building, mounting the VHF antenna, mounting the Ubiquiti NanoStation (NSM3), running about 50 feet of LMR-600 coaxial cable to the VHF antenna, running about 50 feet of exterior grade Cat5 cable, sweeping the VHF antenna with our AIM antenna analyzer, installing a Grandstream VOIP telephone for the MESH, and then testing the MESH network itself. It took us the better part of 5 hours to complete all the inside and outside work, but when it was all said and done everything looked good. The VHF antenna swept clean and right on target for resonance, and when the MESH node fired up it immediately connected with our Hillside North node with a throughput of nearly 80 Mbps! I can tell you that I was indeed a happy camper! There is a bit of configuring yet to attend to, but this install is virtually complete with no disasters, thanks to KL7IPO leading a safety and work plan meeting before we got at it. Thanks to Zach for all that outside work; we are very thankful that his fingers didn’t freeze off! 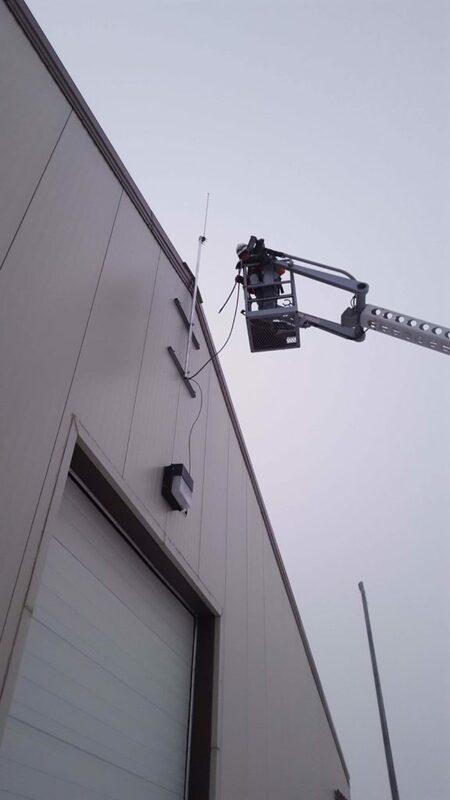 The Anchorage area MESH network continues to expand and serves an important role for our EMCOMM capabilities. It is, in effect, a force multiplier that augments, enhances, and leverages communication flow, whether it be of a tactical nature or full-blown formal message handling. To learn more about the MESH, visit the RSOC during a Working Wednesday or Saturday. 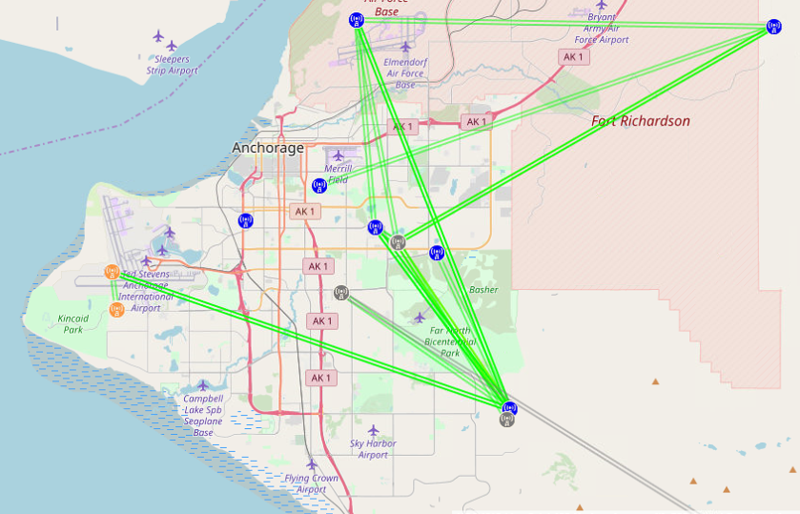 Below is a visual that shows most of our network on a map of Anchorage.